— Smollett receives a racist and homophobic threatening letter at the studio in Chicago where “Empire” is filmed. Police later say that they believe Smollett sent the letter himself. — Jussie Smollett tells police he was physically attacked by two men in downtown Chicago while out getting food from a Subway restaurant at 2 a.m. The actor says the men used racial and homophobic slurs, wrapped a rope around his neck and poured an “unknown substance” on him. 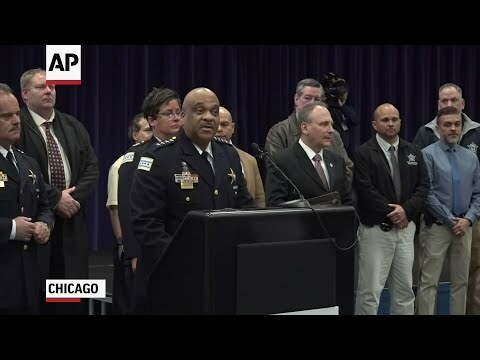 Police say Smollett, who is black and gay, told detectives the attackers also yelled he was in “MAGA country,” an apparent reference to President Donald Trump’s “Make America Great Again” campaign slogan that some Trump critics have decried as racist and discriminatory. — Smollett’s family issues a statement calling the attack a racial and homophobic hate crime. Smollett’s family says he “has told the police everything” and “his story has never changed,” disputing assertions leveled on social media that he had been less than cooperative and changed his story. — Smollett gives a concert in West Hollywood, California, opening with an emotional speech, saying he had to play the show because he couldn’t let his attackers win. — Chicago police pick up two men they identify as Nigerian brothers at Chicago’s O’Hare International Airport on their return from Nigeria after police learn at least one worked on “Empire.” Police question the brothers and search the apartment where the men live. — Chicago police investigate tip that on the night Smollett reported being attacked, he was in an elevator of his apartment building with the two Nigerian brothers. Police later dismiss the tip, saying it’s not credible based on video evidence. — Chicago’s top prosecutor, Cook County State’s Attorney Kim Foxx, recuses herself from the investigation. Her office says the decision was made “out of an abundance of caution ... to address potential questions of impartiality based upon familiarity with potential witnesses in the case.” No details were provided. Foxx later says the reason for the recusal is that she had conversations with a Smollett family member after the incident was reported in late January. — Chicago police say the Cook County State’s Attorney has charged Smollett with disorderly conduct for filing a false police report that he was attacked by two masked men. Police detectives were contacting Smollett’s attorneys to arrange his surrender for arrest. — Producers of “Empire” say Jussie Smollett’s character will be removed from the final two episodes of this season.